There are likely thousands of people far more qualified to write this than am I. I never served in the armed services, although I have tremendous admiration for those that currently serve and those that have. I did not know Jon Cavaiani his entire life but was fortunate enough to meet him several years ago and got to learn what an amazing man he was. And I’d like to remind the racing community that this past week our country lost a true hero. I was introduced to Jon by Roger Burgess a number of years ago. Roger, also a vet, served with Jon for several years and the two had become close friends. Roger had also been a big supporter of the Medal Of Honor Society of which Jon was a member. When I was first introduced to Jon I must admit I was a little nervous however Jon made it instantly apparent he did not see himself as an important person. He was welcoming and not the least bit intimidating. His voice was raspy from a battle injury, his walk was stiff from another battle injury, his smile was huge and his handshakes and hugs were bigger. He laughed all the time. I was working with R2B2 Racing at the time and Roger would host several Vietnam vets at each race. Jon would fly in for these ‘get-togethers’ to meet and spend time with each of the vets. If you took time to stand back and watch the interaction between Jon and the Vets it was amazing. They of course had the utmost respect for him but he also did for them. He was so giving of his time. He would talk to them about Drag Racing or their family or their time in the service or anything else. It was on these weekends that I also got to spend time with Jon. I might guess that you don’t know the details of Jon’s story, his time as a POW, or why he was selected to receive the “Medal of Honor”. I think you should. You should buy a book about all of the Medal of Honor heroes or at the least search the internet and read about some of their stories, especially Jon’s. One important point I’d like to share about the MOH members. They didn’t “win” the Medal Of Honor. It wasn’t a contest. It wasn’t a lottery. They didn’t do what they did, to earn the Medal of Honor. Not one of them was seeking this prestigious award. What they did was demonstrate incredible courage to protect and save the lives of others while placing their own lives at risk. It was a selfless act. Jon pointed out to me once that there were definitely many, many more acts of selfless courage that never got reported simply because no one survived to tell the story. The last time I was with Jon was in Washington DC. A friend of ours, Bob Pence, hosted a “Christmas Concert for the Troops” at the Kennedy Center. My wife, Lana and I were told we could bring a guest. We immediately thought of Jon. I was not sure if he would make the trip across the country for one night but I called to ask. He said that if it was a tribute to the “troops”, he’d be there. That night at the Kennedy Center I saw, among many others, a US Army General wait in line to shake Jon’s hand. I sat next to Jon while he was introduced to the audience of thousands which gave him a standing ovation and when the evening was over I watched him slowly descend a flight of stairs carefully holding the railing. I asked him if he was hurting tonight? He laughed out loud and said he was always hurting! Jon was a man who gave everything and asked for nothing in return. If you never got to meet Jon, I wish you had. He would have added something to your life. 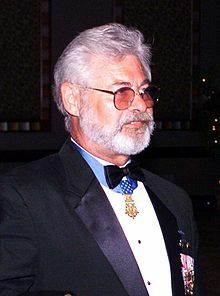 Last week there were 80 living Medal of Honor recipients. This week there are 79. To Sergeant Major Jon Cavaiani, a man who lived in the arena…thanks for your kindness and service.